What Would Jesus Do About Iraq? What Could the Democrats DO? Advocates a New Bottom Line in America. This bottom takes into consideration not only how well institutions and the economy maximize money and power, but how well they maximize love and caring, ethical and ecological sensitivity and behavior, kindness and generosity, non-violence and peace, and the extent to which they enhance our capacities to respond to other human beings in a way that honors them as embodiments of the sacred, and enhance our capacities to respond to the earth and the universe with awe, wonder and radical amazement. Challenges the misuse of religion, God and spirit by the Religious Right. Challenges the anti-religious and anti-spiritual assumptions and behaviors that have increasingly become part of the liberal culture. Challenges the extreme individualism and "me-firstism" that permeate all parts of the global market culture. To become an NSP member, click here. Despite their inability to fundamentally change Israeli policy, protest groups remind Palestinians that many Israelis oppose the Occupation. Please help us stand up for Congressman Jim Moran. A Jewish Renewal understanding of the State of Israel: we are both strong supporters of Israel and very critical of its treatment of the Palestinian people. A perfect example of how US policies are hurtful to the well-being of 3rd world countries. Poverty doesn't just "happen"--it's created by the advanced industrial societies. Here's how. Cornel West, Rabbi Michael Lerner, Sister Joan Chittister. A synagogue and community of people in the San Francisco Bay Area who seek a world of peace and justice, love and kindness--and who seek to connect to the universe with awe, wonder and radical amazement at the grandeur of creation. Blending spiritual and social justice concerns in a way that is both completely authentic to Jewish tradition and yet simultaneously open to the wisdom and deepest truths of all humanity. We are an international community of people of many faiths calling for social justice and political freedom in the context of new structures of work, caring communities, and democratic social and economic arrangements. We seek to influence public discourse in order to inspire compassion, generosity, non-violence and recognition of the spiritual dimensions of life. 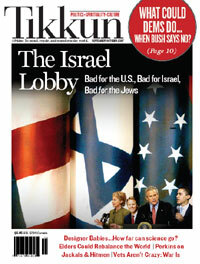 Copyright © 2005 Tikkun Magazine. Tikkun® is a registered trademark.